The 2014 Long Island Woodworkers’ Show included some amazing pieces. 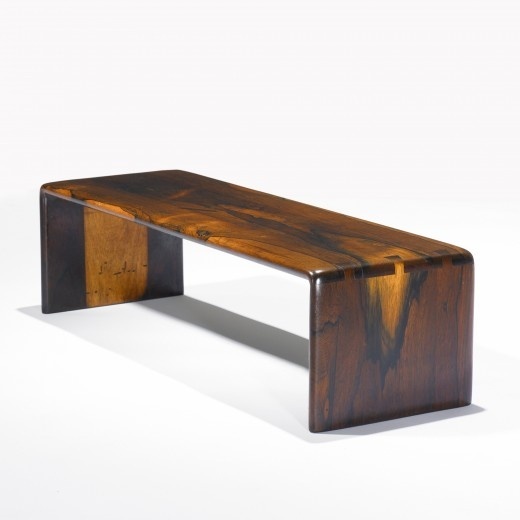 While admiring the pieces, my Dad noticed a nice low bench made by Tony Fuoco. He mentioned that it would work perfectly at his house on the landing where he changes his shoes as he goes from the shop into the house. To that I asked that he please not make or buy one. I immediately got to work on my design. I began by looking though my copy of Education of a Woodsmith by Arthur Espenet Carpenter (if you’ve not read it, you should). Carpenter shows many of his amazing pieces in the book. 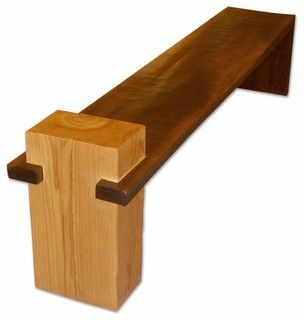 I took a liking to his style of making benches and tables by taking a single board, cutting the ends, and then reattaching them as legs via dovetails. I also did some looking on Pinterest and found some benches I liked. One used a live edge piece and had one leg jointed similarly to Art Carpenter’s benches. For the other leg, they used a large, square block of wood. I liked the juxtaposition of the live edge to the square block. The bench I found on Pinterest. With these pieces as inspiration I took a look through my lumber stack and worked out my own design. I settled on using a live edge board for the seat with one leg made from the same board and dovetailed on similar to the Pinterest bench. I’m not sure what type of wood I choose for the seat. It’s a smooth, blond color with minimal grain prominence which I picked up from Kari Hultman many years ago. For the remaining legs I chose to use two big square legs Instead of the single large block used a leg in the Pinterest bench. Along their tops, I jointed them with a cross piece for aesthetics, strength and to act as an arm. Both legs and the cross piece were made from the same piece of walnut for continuous grain. With the design finalized and the lumber down from the attic, I set about milling.